The lyrics above are from Ruined In A Day by New Order, a tune that quickly sprang to mind when I watched the development of the micro blogging service Jaiku today. You see, I believe something has changed over the course of the weekend. A few days ago a new Swedish micro blog called Bloggy opened up for the public and the timing just could not have been better. With Google abandoning Jaiku and a wave of interest among both users and media for micro blogging in general, the market conditions were perfect for a local challenger to Twitter. And let’s face it, Google hasn’t done much to please us Jaiku lovers since they acquired the service in 2007. Now, I’m quite aware that Sweden is not the center of the social media universe, but the community that has grown around Jaiku has been very local and we affectionately call it “the bubble”. Our little bubble has been able to keep together and hold up well against the Twitter invasion, although many of us have chosen a schizophrenic approach with presence in both worlds. That is, until now. During the weekend, Morris Packer, one of the influential Jaiku users in our bubble, suddenly proclaimed that he wanted to move from Jaiku to Bloggy. With the help of several positive articles about Bloggy in mainstream media, a flood of users joined Bloggy on Sunday and today, or at least they started following each other’s feeds in large numbers. That wouldn’t be any problem, but it seems that the transition to Bloggy has already had an effect on Jaiku. It has been very quiet today and instead of the usual buzz and commenting we have seen that people started to cross-post from Bloggy to Jaiku (notice the “bloggy.se” at the end of each post) and many of these posts are entirely without comments in the Jaiku feed. My guess is that people left comments on Bloggy instead but I have no proof to back up my claims. Of course it is still too soon to pull the plug on Jaiku but Jonas Leijon, the entrepreneur behind Bloggy, is completely integrated with the Swedish social media crowd and listens to the wishes of the users. A stark contrast to the absent owners of Jaiku. Maybe it is just a sign of curiosity and people are trying out the new service. So I hope that I’m wrong because I’m not ready to move to a new service just yet. But if the trend continues I don’t see I have much choice, especially since Bloggy is developing rapidly with a bunch of nice features that Jaiku is lacking. Either way, today Jaiku has been an empty shell. Will people return? Whatever the answer is, it is fascinating to study how little it takes for a whole community to shift to a new and cooler place. 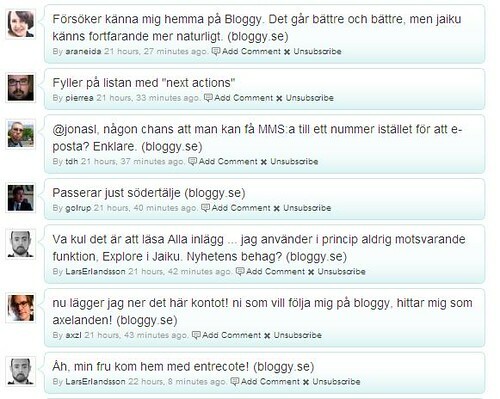 Tags: twitter, jaiku, bloggy, jaiku, mikrobloggar, twitter. Ping.